MAI Journal: A New Zealand Journal of Indigenous Scholarship is an open access scholarly journal that published multidisciplinary peer-reviewed articles around indigenous knowledge and development in the context of Aotearoa New Zealand. MAI Journal welcomes papers that critically analyse and address all indigenous issues in the context of Aotearoa New Zealand. MAI Journal has grown from MAI Review, the journal of the former Capability Building programme of Ngā Pae o te Māramatanga. MAI Journal reflects developments in the vision and mission of Ngā Pae o te Māramatanga, the landscape of indigenous research in Aotearoa New Zealand, and builds on the legacy of MAI Review. 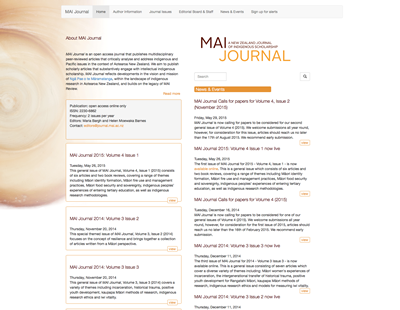 For more information, please visit the MAI Journal website.